Back in February, Betanews published a column from me about Apple’s iPod Shuffle. I’m working on another column, on iPod nano, and decided to post the earlier one here. On Thursday, as I headed back to Washington from Washington (to D.C. from state), I spotted an iPod Shuffle; the guy seated directly in front of me had one, which noticeably hung around his neck. I got to thinking about the brilliance of Apple’s simple approach to music, which is so much about cool. Already, those white headphones, which contrast against just about every head or outfit, are now a pseudo status symbol. Next, looks like music cool just might be the white rope around the neck with iPod Shuffle attached. The approach demonstrates many of the things that Apple is doing right with digital music players. The company has turned a knack for the understated into a marketing machine that touches virtually every Mac product, including iPod Shuffle. 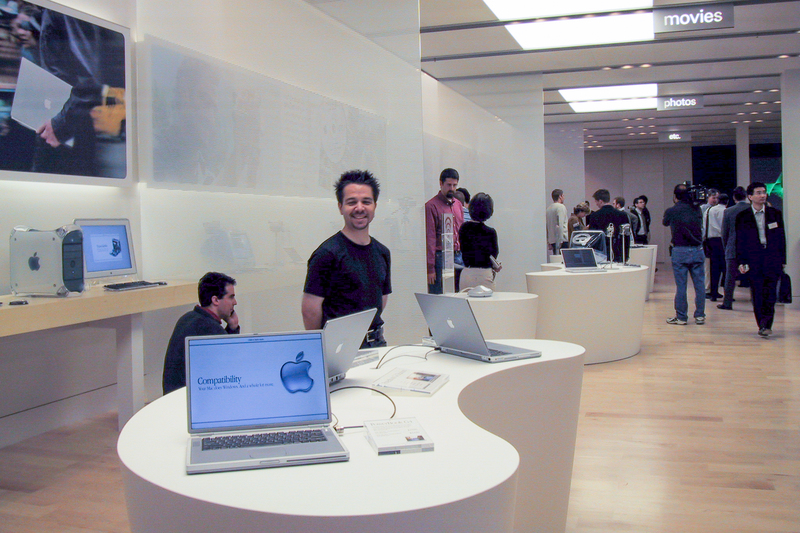 Apple retail stores are remarkably understated. The only bright colors are found on marketing material placed throughout the store. Otherwise, the tasteful stores are quite stark, so that the shoppers’ eyes are drawn either to the colorful marketing posters and signs or to the products on sale. Back in the early 1990s my wife, who is a graphic designer by trade, and I worked at the same magazine. So, I spent lots of time in the magazine’s graphics arts department, where I also had plenty of knock-down, drag-outs with the designers, who had a tendency to over-design the layouts. Busy page layouts tend to draw attention away from the text – and isn’t the magazine buyer supposed to be a reader? Better design is understated, where pictures and graphics draw the reader’s attention to the text on the page. The same concept should apply to retail; clutter distracts the shopper and draws attention away from products for sale. Apple’s understated approach puts the focus on the products. Mac computers are equally understated, yet distinctive from Windows PCs. Take, for example, the Titanium PowerBook and successor Aluminum PowerBook. They aren’t all that remarkable, yet attractively distinctive because of what’s missing. Many Windows notebooks tend to appear bulky by comparison, in part to support legacy connectors that Apple did away with years ago. Then there is Apple using diminutive slot-loading optical drives, instead of tray counterparts, which along with the missing ports help make for a thinner, lighter notebook design. The less-is-more approach means a Mac user can carry a full, desktop-replacement notebook that’s about an inch thick and weighs only about five-and-a-half pounds. By comparison, many desktop-replacement Windows notebooks are bulkier and typically weigh in at eight, nine or 10 pounds. Mac OS X is remarkably understated, particularly compared to Windows XP. The dominant colors are white and brushed steel (OK, so maybe that’s no color). The approach draws the user’s eyes where they need to go and makes it more difficult to get lost or confused about where to click or what to do. Color contrasts against the white to highlight what’s important, like buttons — red, yellow and green — for changing a window’s view. Apple uses its understated approach to strip away complexity, too, in virtually all its products. Any iPod is the best example. To synchronize music between a PC or Mac and an iPod, the user needs to do little more than plug in. There are no dialog boxes or multi-step processes. Plugging in synchronizes the iTunes library with the iPod. The synchronization process is highly understated, but in the right way that strips away complexity and so improves the user experience. A couple of months ago, I asked my 10-year-old daughter to try out a couple of portable music players and synchronize music using Windows Media Player 10. Repeatedly exasperated, she gave up. Oh, and she was grumpy about it, too. The problem: The processes were overstated, so to speak, and so overly complex. Few weeks back, a friend brought over two iPod Shuffles (grammatically, it really should be iPods Shuffle, but Apple, thinks different — ah, differently — about plural use). He had called from the Apple Store in San Francisco, the only place with iPod Shuffles at the time and insisted I needed two. Sunday after Macworld, he dropped off the music players, and I coughed up two C notes and another 10 bucks for tax. My daughter, who has an iPod mini, simply couldn’t wait to get out the iPod Shuffle. But she had to. I insisted on getting a full battery charge, which took more than four hours hooked up to her iMac G4. While the iPod Shuffle charged, my daughter started working through her library of about 350 songs. From watching Steve Jobs’ Macworld keynote address from the Web, she figured out that rating the songs would make easier the synchronization process. So, she rated her favorite songs, a task never done because she mostly listens to music on a portable player. I had actually wondered if this would be a problem, not just for her but other people. Based on Apple’s discussion of Shuffle synchronization, emphasis seemed to be on Shuffle mode pulling off songs based on frequency of play. But what would that mean for people that rarely listened to music on their computer – those folks, like my daughter, that favored the portable music player? Sure enough, when set to auto synchronization, iTunes 4.7 mostly filled up the iPod Shuffle with songs my daughter listens to least. Fortunately, Apple had created other ways to Shuffle synchronize the music player. My daughter started over, first by synchronizing her top-rated songs and then working through other criteria, such as playlists. She worked through this process until the Auto-Fill function indicated the iPod Shuffle could hold no more songs; 139 was the final tally. The iPod Shuffle wisped away my daughter’s memories of the previous, frustrating synchronization experience. Apple’s Shuffle synchronization actually preformed better than I expected. The understated, Shuffle and Auto-fill, is part of why the synchronization experience is so good. The iPod Shuffle is so remarkably understated some competitors are aghast at the appeal. I’ve talked to vendors that have dismissed iPod Shuffle because of its lack of features, such as a display or FM radio. But they fail to realize that these extras add complexity. The vendors also don’t understated how the whole package — iTunes, synchronization and Shuffle play — makes Apple’s diminutive music player appealing. Then there is that white, so greatly understated, that Apple has turned into a billboard. If you see white headphones, an iPod is almost certainly attached. Or a white computer, it’s almost certainly a Mac. How does a company get the corner on white? What could be more ubiquitous than white? But I would argue that Apple has done just that, and it wouldn’t be the first company to so. For years, white soap was associated with Ivory. Plain and simple – and understated. In a world of color, white dramatically stands out. And so iPod headphones or iPod Shuffle hung round the neck will stand out, as status symbols and as billboards for Apple products. The understated is what gives Apple products so much distinction. Competitors really need to study what Apple is doing right and how to incorporate a similar approach into their product designs and marketing. I’m not suggesting everyone go out and make white products. It’s the approach, not Apple’s execution that matters. Understated often means uncomplicated. And sometimes that means cutting back consumer choices, as Apple did with iPod Shuffle. Less really can be more. For years, Burger King marketed under the moniker, “Have it your way.” But I recall going into a Burger King on Broadway in Manhattan where the express lines signs stated, “Have it our way.” Plenty of people would forgo choice for the quicker meal; the simpler way.